Autumn is making it self known now, all the lovely orange & gold coloured leaves falling. 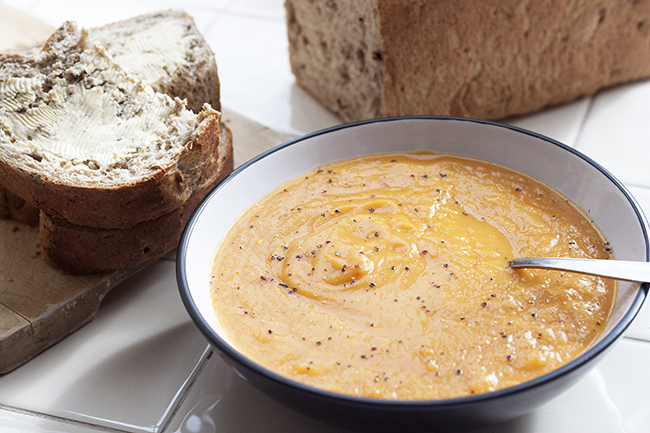 I haven’t been for too many crispy cold walks yet – it’s either warm or raining 🙂 but this sweet butternut squash and chilli soup recipe is the perfect warmer this autumn. Butternut squash has a lovely sweet nutty flavor, I like it best in soup. Not only that but it is full of antioxidants, is low fat and high in fiber – perfect! I have teamed this wonderful fruit up with sweet potatoes. 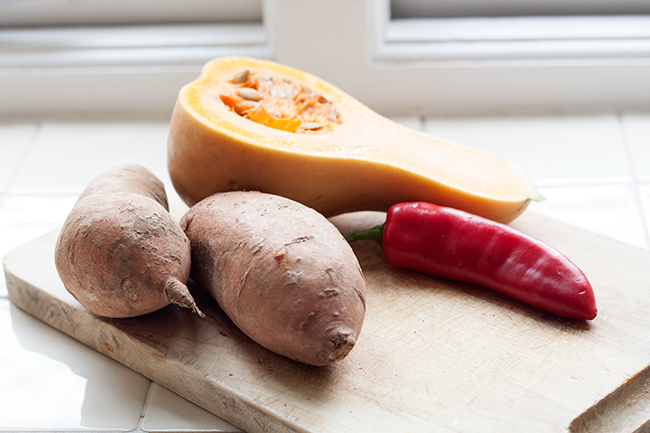 The sweetness of the sweet potatoes goes hand in hand with the butternut squash (as well as the colour) and it helps the thickness of the soup. Adding in chilli gives the sweetness a kick, and is clear in taste. The reason I have chose sweet potatoes in this soup isn’t because they are seen as ‘healthier’ than white potatoes (both potatoes have benefits just different ones) but because of the flavour it adds. By adding white potato I would think it would be too bland. The instructions are if you’re cooking in a pan, but it’s possible to use a soup maker as well. 1. Firstly, you need to prepare your vegetables. Peel and chop your onion, add to the pan. Then finely chop your garlic, add to the pan. Add your olive oil, give it a stir and put on a low – medium heat (with a pan lid on) leave to soften. 2. Peel the butternut squash and de-seed it. Roughly chop it and add to the pan. Peel your sweet potatoes, roughly chop and add to the pan. 4. Give all your veg a stir and leave it soften for around 5 mins whilst you boil the kettle :). 5. With boiling water, dissolve your stock cube with 300 ml water and add to the pan. Top up the pan with an extra 300 ml boiling water. Add your pepper and stir. Speed up this process with a hot water dispenser. 6. Bring your soup to the boil and then leave to simmer for around 30 mins. 7. Once cooked, whizz your soup with either a hand blender or in a food processor. Serve your smooth soup how ever you like! – try adding a dash of cream, pinch of pepper, some freshly baked bread!